Our on-going cast currently has 25 card carrying members, without actual cards, ironically. All are between the ages of 17 and 45, from high school, college, and beyond. Most of our cast lives in neighboring Toledo, OH, however, our cast calls many places home, including Fremont, Bowling Green, and even Detroit. On Saturday night, our kids come out to play in our own special playground. For most of us, our group is like a second, extended family. Although we do sometime have some disagreements, for the most part, we're able to keep these differences and arguments to a minimum. We're an interesting mix of old and new Rocky-ites, bringing together diverse interests and backgrounds; a strange mix of individuals both battle-worn and fresh to the world of Dr. Frank-N-Furter. It all began innocently enough, during a Halloween night in 1995. 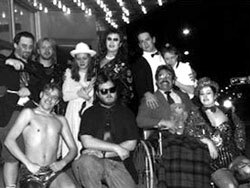 Future cast members saw a showing of Rocky Horror at the University of Toledo, though none of them knew each other at the time. The show was sponsored by the fledgling Strange Journey Revue cast. Chris Moore, having played Dr. Frank some years before, began feeling the old juice stirring inside him again, and he met with Paul Kneririem, the group's fan club rep. The forces of fate were at work, and Chris found himself inexorably drawn back into the fray. As fate would have it, Rocky Horror was to open again in Toledo after an absence of 3 years. Our destination was the Maumee Theater with only one week to spare. That first few weeks at the Maumee were rough, but the few cast members on hand were quickly joined by new converts from the Maumee Theater patrons and the pieces fell into place. The new cast got a new look and was christened the Seduction Production, after Chris's original Toledo cast of the infamous Westwood Theater from the '80's. Early additions included Cindi Fountain, known as Midnight from Ann Arbor, MI's illustrious cast, Velvet Darkness Revue. She reprised her role of Columbia and took on the added responsibility of training the new members. We had to twist her arm, but hell, she liked it. With time, we carefully honed our performance, and came up with almost every conceivable stage prop, such as a real jukebox shell and a wooden tank with ladders you can actually climb up. All of our hard work proved worth it exactly one year from our humble beginnings. In a killer-psycho-blow the roof off Halloween show, the theater was packed, the audience was psyched, and it was one of those rare times where everything happened not only right, but beyond our wildest expectations. We even had Rocky notable, Mike Hess to perform in the pre-show and video tape of the event. Thanks to donated sound and lightning equipment, the show had a rock concert atmosphere. It was a night to remember, but much like a calm before a storm, there was trouble brewing on the horizon. Just before Christmas, the Maumee Theater closed its doors for good. But before anyone could venture to deeply into the first of the 5 stages of denial, there came a ray of hope. The theater management asked us to bring our show to their theater, the Cla-Zel, 20 miles south in Bowling Green. They added onto the old vaudeville stage, extending it over the orchestra pit. Colored footlights were installed, a sound system for pre-shows was added, and the spotlight from the old Maumee was kept. All this against the backdrop of a well preserved, though deliciously worn around the edges, 1920's theater. We've held onto some of our core audience, who travel the extra distance to see our show, and picked up (brainwashed) new converts as well. Rocky Horror is alive and well in it's second incarnation. There's life in the old queen yet. The Seduction Production is an experiment in organization and a tribute to dedication. We strive for that delicate balance between professionalism and being loose. The concept calls for "knowing your part so well that you can forget it". In this way, we can produce a whopping show, and have a lot of fun while doing it, week after week. Our theory is to be as entertaining as possible, even if it means occasionally going off the screen. We're able to gauge what works by watching the audience's reaction. Sure, once in awhile it go too far, (as in playing the Pulp Fiction 'royale with cheese' dialogue over Brad and Janet in the car) but it adds spice to the mix. Chris, our Cast Manager (and part-time slavedriver), oversees creative and organizational decisions. And of course there's the general overseeing of cast affairs and massaging of the theater management to do, also. Brandon assists Chris in as many ways as possible, but his main responsibility is pre-show and tech. stuff. Cindi with her exceptional knowledge of "every movement that every character makes in every scene" handles the training (assimilation) of new members, and the occasional polishing (bullwhipping) of old ones. She's a harsh taskmistress, good thing for us. Most of the stage props are handled by Kalibus and the Transylvanians. Other than this, we keep our organization loose. Responsibilities such as publicity, costumes, etc. are handled as the need arises. The Seduction Production performs every Saturday night at 12 midnight at the Cla-Zel theater, Main St., Bowling Green, OH.